The American College of Prosthodontists, comprised of dentists expert in artificial teeth, says that approximately 178 million Americans are missing at least one tooth. Many millions are missing all their teeth, impairing speech, chewing and facial appearance unless they elect to consult a skilled dentist, such as Mark E. Richardson, about tooth replacement. For decades, full and partial dentures have provided people missing one, 2 or all of their teeth natural-looking and reliable tooth replacement. Dr. Mark E. Richardson recommends several types of dentures for his patients, working with each one to determine what option is best. There are basically 2 types of dentures--partial and full. Either may be supported by dental implants surgically placed into the patient's jaw for maximum stability, retention, natural feel and excellent functionality. However, a traditional partial denture affixes to natural teeth on either side of the prosthetics via metal clasps. The natural teeth require some enamel preparation for proper seating and retention of the porcelain or resin teeth mounted on a light metal frame. Traditional full dentures help people missing most or all of their natural teeth. Fabricated according to dental impression and the dentist's instructions, full dentures stay in the mouth via suction or attachment to remaining natural teeth. 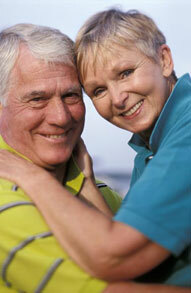 Many individuals opt for conventional full dentures. These prosthetics are placed after tooth extraction sites are fully healed, and dentures fit correctly over gums and bone which shrink as they heal. The fit and look of conventional dentures are adjusted over several "try-in" appointments to ensure functionality and aesthetics. Dr. Richardson focuses on creating a denture that looks natural and is appropriate for the individual's gender, facial appearance, age and personal preference. Other individuals opt for immediate full dentures. This denture goes in the mouth right after tooth extraction. One or 2 preliminary appointments take care of impressions and sizing before the dentist extracts the damaged natural teeth. After extraction, the dentist places the immediate denture right over the empty tooth sockets, and the patient leaves with a complete smile. Immediate dentures work well for many people, but do require adjusting in the weeks after tooth extraction. Many times, they need relining as bone and gum tissue shrinks. Typically, patients adjust to their new teeth within a few weeks. Facial muscles learn how to bite and chew, and while speech may be a bit slurred at first, this resolves, too. Dr. Richardson wants his patients to see him if fit problems develop, especially if there are sore spots on the gums. Also, patients learn a new at-home hygiene routine. They brush or soak their dentures with a product approved by the American Dental Association to reduce bacteria and eliminate bad breath. Mark E. Richardson, DDS will be happy to tell you about denture choices and how this traditional dental service can help you achieve a great-looking and functioning smile. Call our Kalamazoo, MI office for a consultation: (269) 343-6907.